Barely managing to scrape a living gathering wood from the side of a busy road, Ranji accepts his lot uncomplainingly. His only concern is to feed his family and keep them safe in their hut beneath the banyan tree. But when a huge new tyre falls from a passing truck, Ranji realises this could change his life forever. C. J. Dubois is the author of a number of award-winning short stories, as well as his first novel, Lignes de terre, which was published in 2011. He also writes non-fiction and in 2013, his biography Clot Bey, Médecin de Marseille, was awarded the Prix Félix de Beaujour by the Academy of Marseille. His co-author E.C Huntley has spent most of her career in sales management in educational publishing. The Tyre is their first collaboration. Just wonderful to get so much interest from this story. 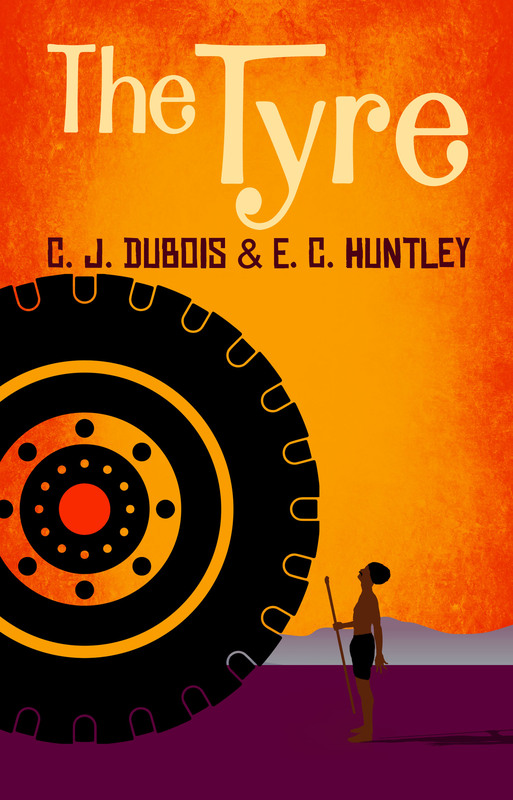 Delighted that our novel The Tyre has been nominated for this award! I loved this book – so glad it is being recognised! Passed this on to my son who also enjoyed it. The subject was so original and we were rooting for the characters all the way through. Months since I read this beautiful book and still the story and characters have stayed with me. A wonderful story for 8 to 70 years old readers. Dreamlike story and full of poertry.I like. A wonderful and life-affirming read. I can’t recommend the Tyre too highly! An insight into the processes of human aspiration. This book would be a worthy winner. A compelling read – good luck! and poverty of one family. Characters stay with you long after you put the book down. Very captivating ,well written tale, pleasant to read. Top book, I recommend everyone to read it! Congratulations for this beautifull story. “THE TYRE” dont j’ai eu l’occasion de lire et d’annoter le manuscrit (cela n’a pas été toujours facile) est à la fois un récit très intime, très humble (dear Ranji et un roman passionnant dont les accents ne doivent leur véracité qu’à la connaissance personnelle et au vécu de leur auteur. Vous le lirez en une nuit ou en plusieurs, mais jamais vous ne pourrez vous en détacher tant sa lecture (j’allais dire l’écriture, mais en fait oui, c’est l’écriture que l’on lit), donc tant son écriture est fluide, sans aucun mot qui n’est son sens. Les personnages, criant de sincérité. The author, Christian Jean Dubois, alias Cri-Cri, is definitely a GOOD WRITER. J’envie ses nouveaux lecteurs! One of my favorites- poignant, compelling, immensely well-written. A book that entertains and resonates. Highly recommend. An evocative tale set in that most evocative of countries – India. Good luck! What a wonderful novel novel. It’s a great story. I enjoyed reading greatly. A subtle commentary on Modern India which is as much fable as story, and characters with whom you empathise and can imagine talking to they are so vivid. Plein d.emotions se dégagent dans la lecture. Les mots traduisent bien la volonté de réussir l.objectif malgré les embûches sur le parcours. Truly an original story told that evokes many emotions. Well worth a read. A wonderful book of ambition and hope that deserves this prize. Best of luck and I hope your ambition is rewarded. The tyre is a fascinating story that keeps you excited so to go on…. You start the book and cannot stop reading….fabulous personnages that reflects deep India. This book should get réal recognition . Plein de pudeur, tendre, bien écrit , passionnant de bout en bout. JC Dubois un écrivain qui monte !! Ce livre m’a procuré beaucoup de plaisir , beaucoup d’émotion . Très agréable à lire , personnages attachants. Description réaliste et émouvante. Bravo. A le fois suspense, sentiments, joies et persévérance. Great story, love to know what happens to the children and makes me apricate the affluence and comfort of life in the western world . Insightful and good to read. Beautifully well written. C’est un livre qui , immédiatement , suscite des images réalistes . On vit la dure vie quotidienne de cette famille si attachante. Ce récit realiste et précis nous a ramene a nos souvenirs de voyageurs : Indes et autres pays . Bravo . A very good book for a large range of people. I am 14 year ,excellent book and really easy to read ! I recomend it ! Un livre agréable à lire, une histoire bien ficelée dans un paysage décrit avec précision sans fioriture, une fin inattendue, tout ce qu’il faut pour aller jusqu’au bout avec délectation. Un grand bravo. This tyre will make you travelling and discovering mysterious India. A lire. Vision très réaliste de l’Inde. Great book, captiving and inspiring! Could be easly moved to movie in line with “Lion” from Garth Davis. Un roman passionnant et émouvant où l’on découvre et partage la vie d’un intouchable en ayant la sensation d’être physiquement près de lui pour l’accompagner et comprendre ce qu’il ressent. Ce livre vous fait découvrir un pays avec des coutumes différentes et la vie très particulière des “intouchables”. L’intérêt du lecteur est vif et maintenu tout au long de l’ouvrage. On ne peut que recommander sa lecture. Ch.Dubois est un auteur talentueux qui a également écrit d’autres ouvrages variés où l’on peut apprécier ses différents talents. Very touching story. Will.never forget it. Great book. Congratulations and good luck! The Tyre is beautifully written. It drew me into its Indian world with tenderness and care. I found it constantly engaging and enlightening and was one of those books that I was sorry to leave off when it finished. What a read! Spellbinding and real in the same breath; a story that carries the reader along with its unfolding. A great book club read as well. Remarkably touching and unusual. Another mode of life most of us have only a clicheed knowledge of that the novel gives concrete, positive substance to.